READING: Moxyland, Lauren Beukes. A smart, gripping and disturbingly-plausible SF thriller. Enjoyed this one a lot. Interesting mix of ghost story and police procedural that makes good use of one of my favourite elements, transfer of memory. Surreal, creepy story about apocalypse-by-clown. WRITING: A new 1,600 word ghost story. WATCHING: In the Flesh, the new BBC3 zombie drama. The premise is the same as Joy Kennedy-O'Neill's Aftermath (Strange Horizons), one of my absolute favourite stories ever--there's a cure, and the ex-zombies are trying to go back to normal life. The world appears slightly less broken here--the vibe is more of a civil war or military invasion than an apocalypse--but the issues of responsibility, adjustment and guilt are still very much forefront. The situation for Kieran and his family is doubly fascinating, given that he was a suicide. It also looks like they're going to make good use of 'it's different when it's MY family,' which is a trope I love. So far, I like it a lot. Also Being Human season 5. I think I was too far into Mitchell-withdrawal to appreciate season 4, but I've come round to Hal a lot, and I love his relationship with Tom. Will be interesting with the US version starts, to compare another set of characters. LISTENING TO: Trivium and Slipknot. Very loudly. These boys going RAAARRR! on the stereo is about the only thing that drowns out my next-door neighbour going RAAARRR! at her kids. Also Heaven, by Depeche Mode, which I love. Seems very strange to think of these boys as elder statesmen now, but I suppose they are. I think my inner body clock stopped somewhere around age 23, so I always imagine that the 80s was just last decade. It regularly shocks me when I realise just how long ago it really was. SELLING: 'Destiny Fell in Love,' a fantasy flash, to Every Day Fiction. This is one of my favourite sites, so it's always a thrill to have a story there. I expect it to run in May. 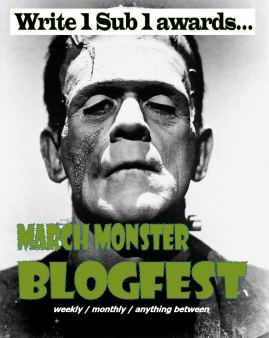 The Write 1, Sub 1 March Monster Blogfest! 'Destiny Fell in Love', from Every Day Fiction. Also had stories advanced to the 2nd round at Daily Science Fiction, Waylines, Apex, Andromeda Spaceways, Bete Noire and the Journal of Unlikely Entomology. Yes, the 80's doesn't seem as long ago as it was, a sure sign that I'm probably older than I generally think too. Super congrats on all your great stories and acceptances and meeting your W1S1 goals. Wow. That's a lot to keep fingers crossed for Michelle. All those second rounders. Well done.